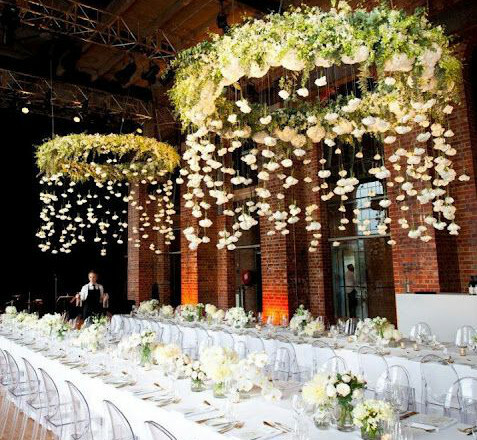 Deciding upon the best event space or venue is very crucial to your event’s overall success. It may be a corporate party, a wedding, a birthday or an awards night. Whatever the reason, the venue will hold everything in place. 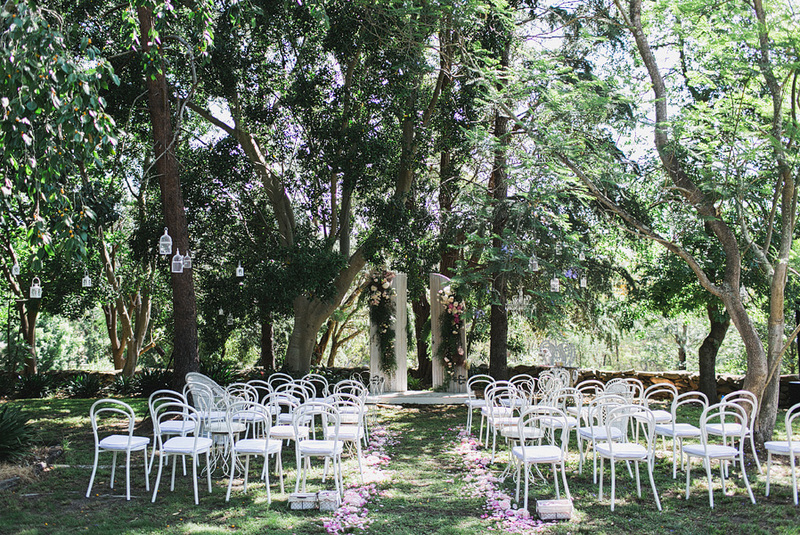 Although finding a venue takes time, it doesn’t have to feel like a daunting task. Let’s say you have already identified the type of event you’re planning and the purpose of the party - now all you need is the venue. There are different factors you need to consider when selecting the right venue for you. 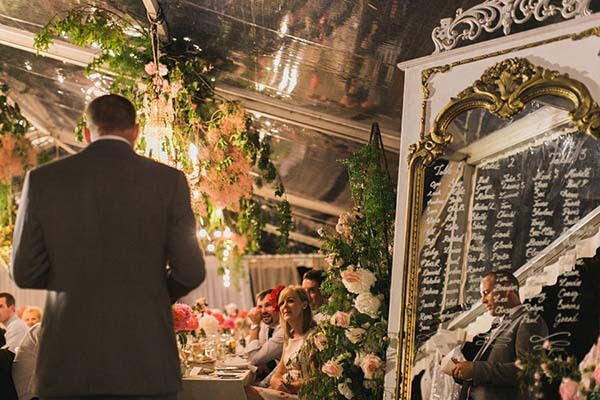 Before we discuss some of the best venues and event spaces, let’s go through the factors you’ll need to consider when choosing one. When choosing a venue, knowing who your guests are and how many will be attending the event will give you an idea of the capacity you need. You have to make sure that you know at least an accurate estimate of the number of guests since this will limit your venue options. The venue should also reflect the guests taste and expectations. Timing is a big factor when choosing your venue. The date of the event will be the next limiting factor. Depending on your event, you may be either flexible with your event date to get the venue you want or you have to be flexible with the venue of your choice in order to get a date that works. With an open-ended budget, you will have hundreds of venue choices, but it is more likely that your budget may be limited. 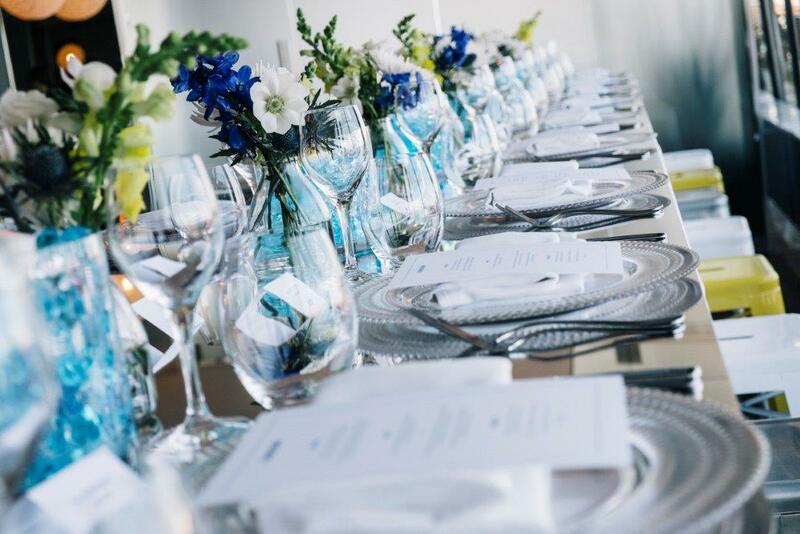 So, you should be aware of your budget limitations beforehand, but you can always plan a great event within a reasonable budget. After having the number of attendees and the possible dates narrowed down, it’s now time to know the locations of the venues on your list. Other than hotels and event conferences which are very popular, you can further narrow down your options to which venue is the most convenient for your guests or to a location which will increase the RSVP rate. The venue that you will choose should also have the appropriate space for the type of event you’re planning. Also, does it have a space for a dance floor, does it have their own PA system? What kind of table setup will you require? Does the facility’s condition reflect your standards? Does the venue meet the criteria of the event? The venue should also have ample parking space (or easy access to public transport), offers good security, possibly offer services like catering, tables, chairs and linen rentals or floral arrangements if needed. A venue’s reputation is sometimes the difference between holding a good event and having a truly great event. You can see it by how the venue manages their staff, facilities and their clients. You will feel they care if they treat you like a VIP or the venue is flexible to your requests. Schedule a site visit to actually see the venue and see if it fits your criteria for the overall feel of the event. Ask for a tour around the venue including the entrance, the different spaces available, bathrooms and parking lot. The Roundhouse is the venue of choice for the biggest music acts and has evolved into accepting a range of events. 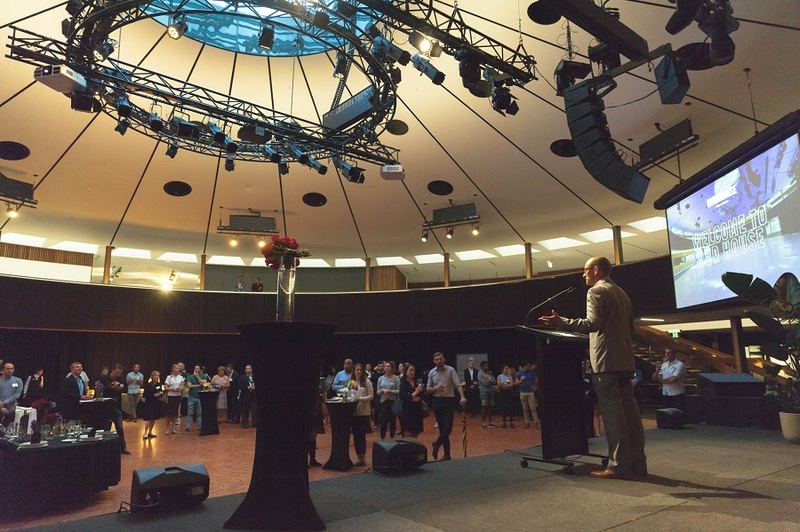 The Roundhouse can do concerts, conferences, product launches, dinners, parties and weddings. The venue has a capacity for 10 to 2,200 guests with a panoramic room that can seat up to 1,000 guests or 500 individuals for a banquet style party. The venue also provides a cutting edge AV system with a modular stage and PA systems with 50 years of experience in creating a great production. It also offers a 360 degree balcony with 8 flexible breakout rooms with built in AV systems. These spaces can be customised with removable walls, thus you can combine all rooms into one. Menu types can be formal plated, buffets, canapes, cocktails and food stations. Drinks could include bubbly, beer and non-alcoholic drinks since the venue is suited for big parties to small intimate gatherings. 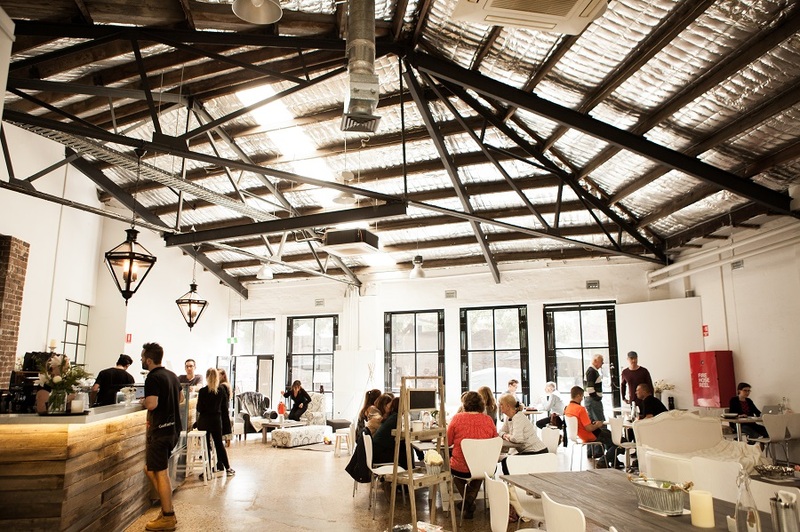 The Freedom Hub is a 100 year old warehouse event space located in the suburb of Waterloo, Sydney. The venue is constructed with high ceilings with black steel beams which are perfect for hanging gardens, festive lights and bright flowers. 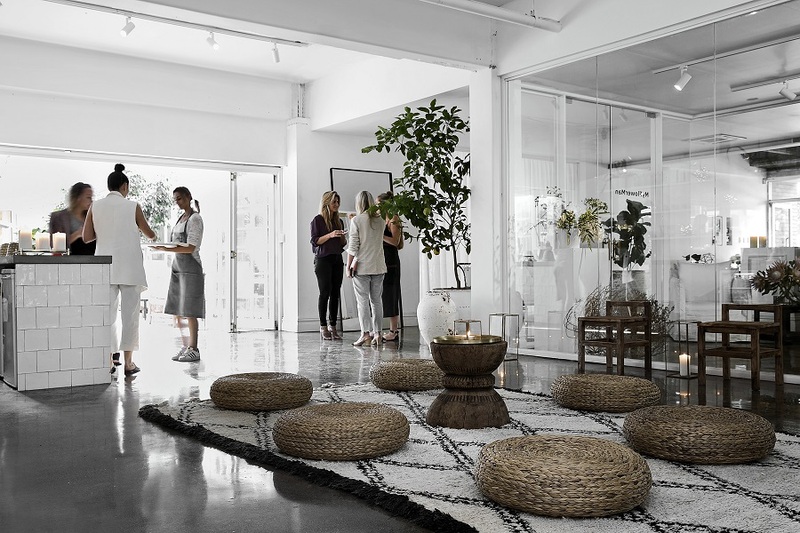 The cement floor is hand made of hand smashed river pebbles with white wash walls and large windows that add to the beautiful natural lighting. 100% of profits from The Freedom Hub supports victims of modern slavery & human trafficking within Australia. Their slave free supply chain and preferred suppliers ensure that they run ethical events, ethical weddings and your guests will love the feel good factor. Cocktail events for up to 150 guests. La Porte Space is a multifunctional and unique space that provides luxurious creative spaces for leading industry businesses. La Porte Space is located within the walls of a restored 1930 heritage building which offers a range of Scandinavian designed studios and concept spaces perfect brand showings, fashion shows, cocktail parties, media dinners and small corporate events. The venue can accommodate up to 400 guests with 5 function spaces. Reunions with buffet style dinners. Click here to check out other excellent venues for your next event or party. Enjoy! When planning a wedding you want to make the event as memorable as possible, and this is why it is so important to take advantage of today's latest wedding catering trends. After all, no one forgets a fantastic meal! Let's take a quick look at a few of them. While it might seem traditional to provide guests with already prepared food items, the truth is, letting your guests get interactive with the foods they enjoy at a wedding is a great way to make the event more memorable. With interactive culinary kiosks, guests can easily customise their cocktails and meals. While they are enjoying a nice, slow dance on the dance floor, the chefs and bartenders can be creating their specific culinary requests. 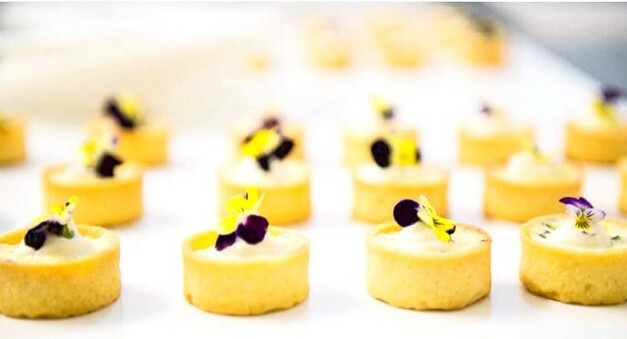 One type of food that you will definitely want them to customise is canapes. 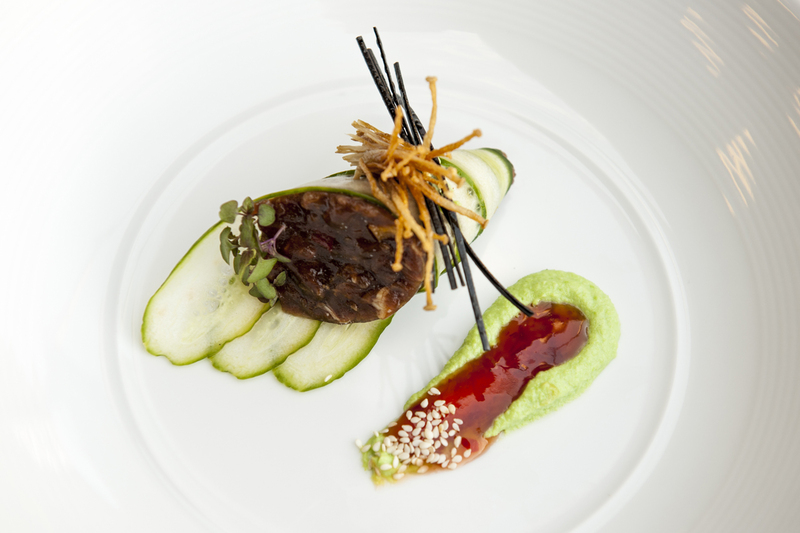 Check out our extensive canapes menu here. There is nothing better than providing wedding guests with a meal that is not only hearty but healthy too. By using organic ingredients, it becomes possible to create food items that are good for the heart and good for the soul. With this in mind, it's always a good idea to offer at least one or two green courses on the wedding menu, such as a fresh salad or organic string green beans. And don't let the healthy eating stop with food. Did you know many types of alcoholic beverages can be created with organic ingredients? With this in mind, you'll want to ask your catering company about the various organic beverage options they provide. When picking out wedding linens and flowers, you are definitely going to want to consider your food options. 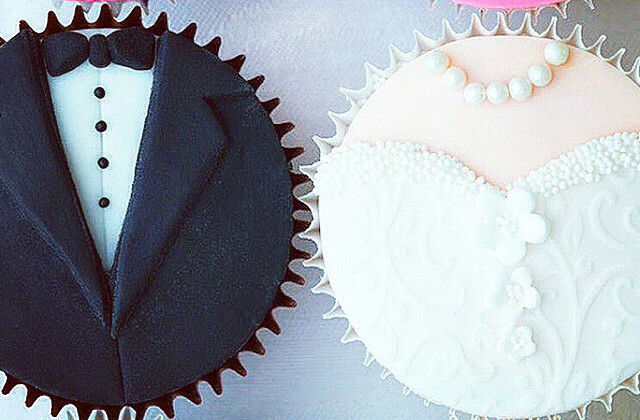 Yes, your food will need to coordinate with your wedding decor. Today's top wedding catering companies have started infusing various colors into different food items, easily allowing food menus to complement wedding decor. To keep things simple, however, you can always go with a black and white wedding and take advantage of ice cream sandwiches on the dessert menu. As far as your cake goes, consider white buttercream icing on top of rich chocolate cake slices. 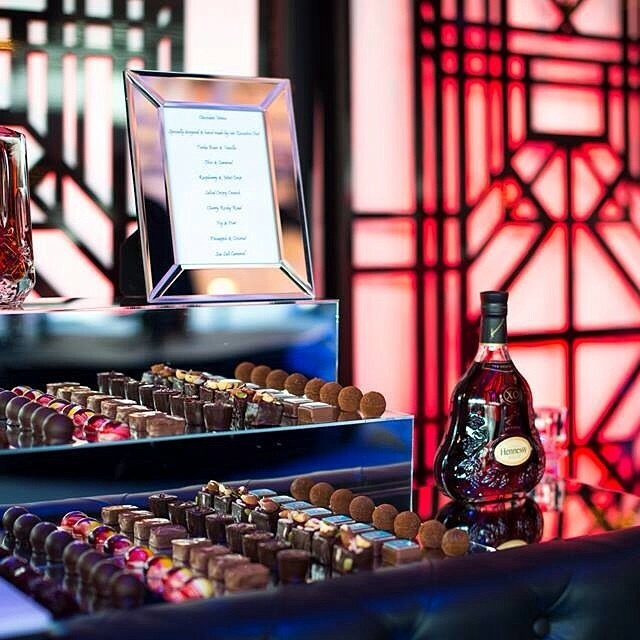 If you're going to serve alcohol, make sure you serve a plentiful buffet of choices. From wines and cocktails to hard liqueurs, you'll want to include everything from California wine to schnapps and more. On your beverage bar buffet, make sure to provide bowls of fruit that can be used to top off the beverages. Some of the best fruits to offer include diced pear pieces, white grapes and a variety of berries. Check out our vast menu of beverage options here. There are a variety of wedding packages to choose from, so it is extremely important that you consider your different options. 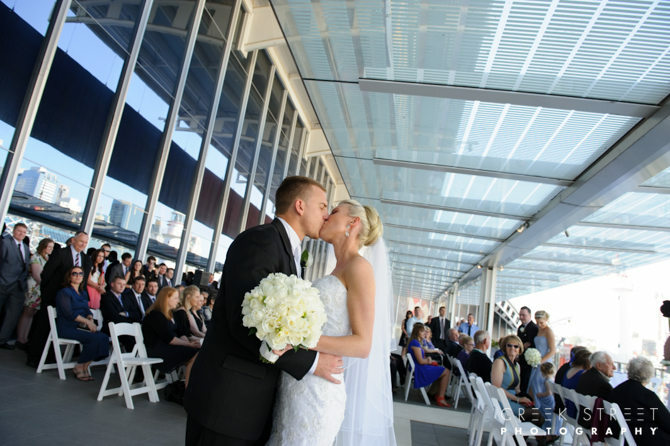 Check out our wedding package options here. Also, make sure to ask your caterer about the different wedding catering trends that are becoming more popular in 2018; you'll want to incorporate these trends into your wedding to make an event that leaves the happy couple and guests with memories to last a lifetime. There are many details that a wedding guest will remember weeks after the reception, but there is something they will never ever forget: how good (or bad) the meal was. That’s why it makes sense to put enough time and plenty of planning into the food, drinks and the right caterer for your reception. But before you start planning your wedding catering, you need to decide on your wedding theme and venue. After you have decided on those two, talk to your fiancé about your wedding reception. No matter what style you choose, both of you have to make sure that you understand all the catering options available before making your final decision. 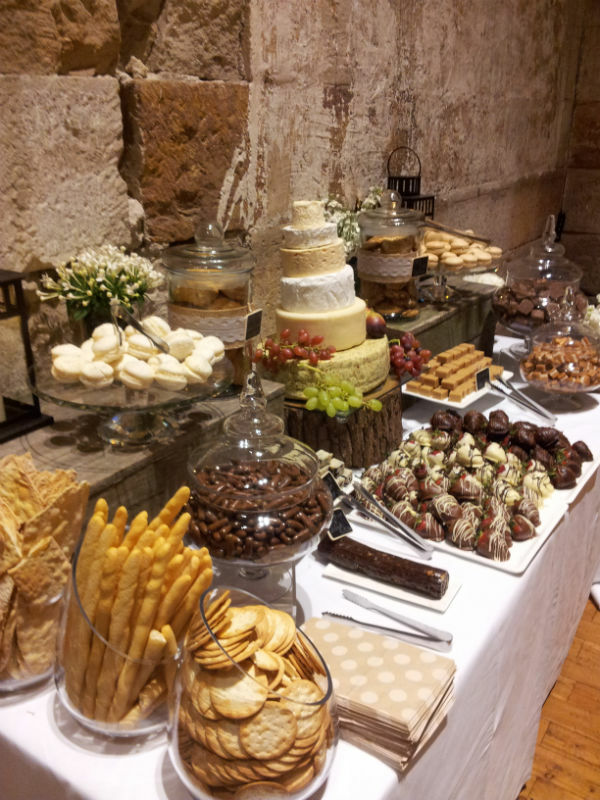 Booking a caterer for your wedding should be straight forward and exciting at the same time. At the start, expect an informal and no pressure talk from the caterers that you‘ll be meeting with. They will get an idea of who you are, what you like and dislike. It can be over the phone or a face to face meeting. A proposal will be created with the menus and the cost for your initial consultation if it applies. This is the most traditional style and has groups of around 10 guests seated at a table assigned to them and with each guest being served three courses or more. If you want an elegant and traditional wedding this is the one for you. For this, you have to consider your venue and budget, since a plated dinner needs more staff to prepare, plate and serve the dish. The good thing is that this style will give guests more time to mingle and it also allows guests to dress up fancy! This style of reception is more suited for an all adults-only guest list. Now that you have already decided on what type of reception for your wedding, it’s time to decide on your wedding menu. Below are some simple steps to help you decide what food and drinks to serve. Take note of the season because certain types of food taste better when in season. Thick soup and stews are not a good fit for summer weddings. Fruits will taste sweeter when in season thus some desserts will be 10x better if the fruits are in season. You can check for recommendations from your friends or family members. Also find professional chefs online, send them an email or chat and ask for their recommendations. Still, don’t take advice blindly without considering your situation and tastes. Are you into Indian food, Thai, Italian, Japanese, Filipino or Mexican food? Basically there are no rules in serving the type of food for your wedding, but you also have to consider the less adventurous eaters. You can have a dedicated stall for people with specific diets that can include gluten-free options, vegetarian meals and child-friendly meals. The menus presented above are just examples of food varieties that can be served for each style. Again, nothing is final until you’ve decided what kind of reception you want to have, what food you want to serve and what is in season. Your chosen caterer will be able to help decide all of this. Happy catering hunting and congratulations! So you’ve just become engaged and you’re wondering when you should have your wedding. Part of you would like to have a summer wedding, on a beautiful warm day with a very lovely evening that everybody can enjoy. On the other hand, winter might be the ideal time to get married. Venues might be easier to book around this time, and there’s always the option of planning a proper white wedding overseas, with a beautiful church in the snow, candle lights and the festive atmosphere. 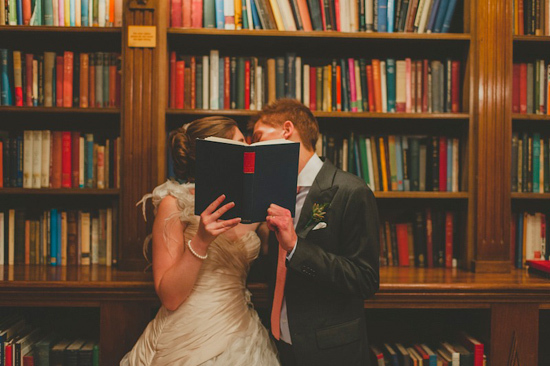 Here are our tips for planning your wedding - whether it’s in summer or winter. Weather aside, the first thing you need to consider if you want to get married during summer or winter is the venue. A number of venues make themselves available at different times of the year. 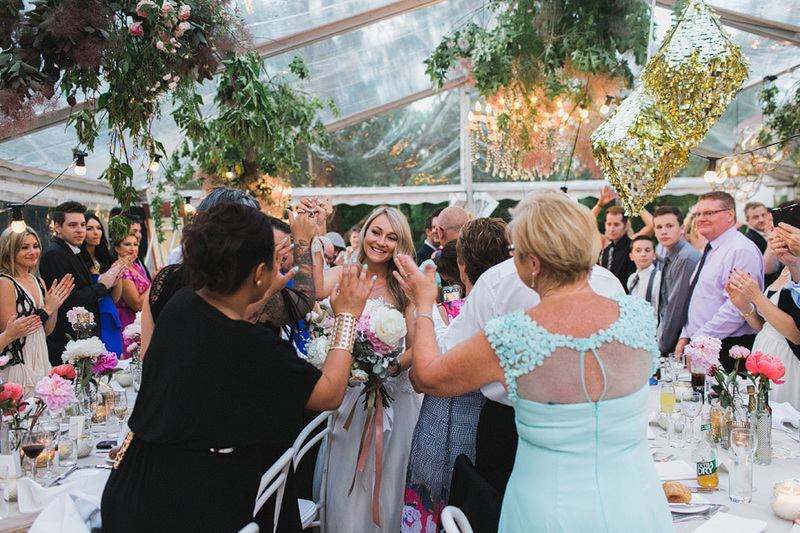 Say for example, if you were able to get a fabulous outdoor area that you want to fill with marquees, then plan on getting married during the warmer months. On the other hand, if you want your wedding to be more intimate and have a cosy feeling, a winter wedding can work to your advantage. Other important things that you need to consider are your budget and the venue’s availability. 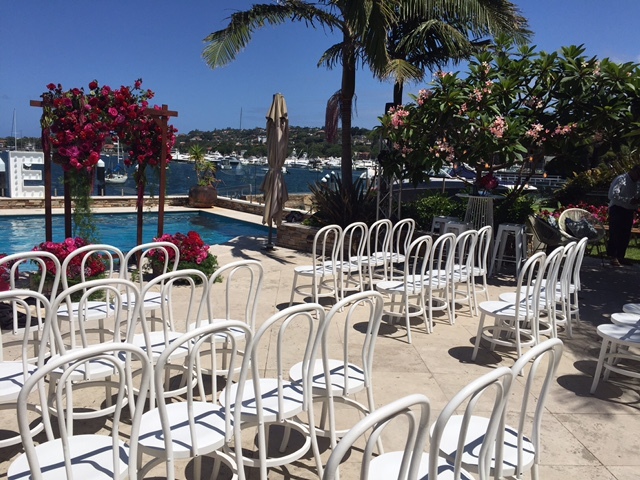 A large percentage of couples tend to marry during summer as compared to winter, thus more popular venues tend to be booked well in advance, specifically on weekends. Also wedding suppliers such as photographers, florists, caterers, and chauffeurs are likely to be very busy. 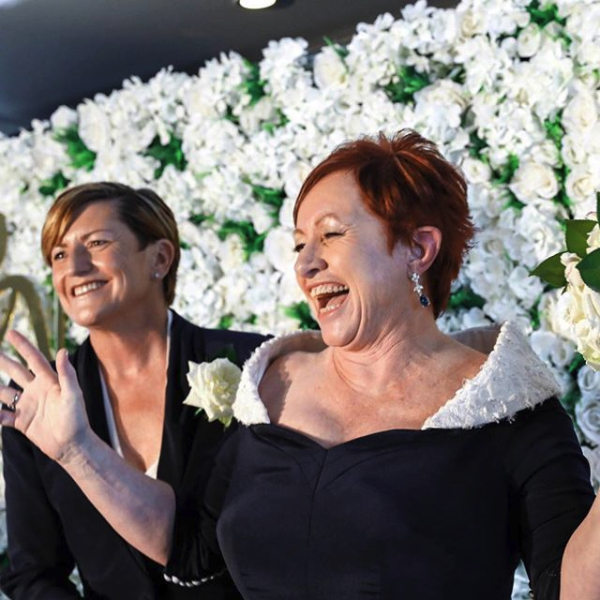 If you schedule your wedding on a less popular day of the week, say Wednesday or Thursday, there’s a high chance that you will get the venue and wedding suppliers of your choice. Keep in mind there can be waiting lists for venues, wedding dresses and decorators during the more popular months so it’s never too early to start planning. One good thing about a winter wedding is that more people will actually attend the event because they are less likely to book holidays during winter. Plus, most people tend to enjoy a good family get together at this time of the year. As mentioned earlier, finding venues and suppliers will be easier if you’re looking to book for winter. This might mean your wedding will be kind to your budget and your stress levels! Your dream venue will likely be more available and they may give a special rate which is always good. Your out-of-town friends may also find plenty of accommodation with special rates. Winter weddings can still be creative. Dress your bridesmaids with brightly-coloured pashminas or scarves. Decorate the venue using tea lights and twinkling candles, serve hot chocolate or warm/hot mulled wine at the reception together with some spicy canape sausages, mince pies, warm soups and hearty stews. Your winter wedding will not be forgotten any time soon, because everyone enjoys something different once in a while. It will be more intimate with a cozy and warm atmosphere. With a winter wedding, you can provide a cozy atmosphere for your reception with a warm and hearty meal using seasonal flavors with classic winter cocktails and treats. For appetisers and main dishes, a soup course will not be out of place. Soup shooters served during cocktail hour is a good starter, comfort foods like mini grilled cheese sandwiches, butternut squash ravioli, tiny spaghetti and meatballs hors d’oeuvres and a hearty meal of meat and potatoes with gravy as your main dish. Drinks can be a spiked hot chocolate bar for the adults. You can set up toppings like whipped cream, nuts, small candies and marshmallows. You can also go for signature warm cocktails like mulled wine and some good old bottles of scotch. For desserts, pies and tarts work well for winter weddings, if your place has no snow and is close to the beach or a fireplace, create a s’mores bar. You can also have pudding, lemon curd crème brulee with hazelnut flapjacks, coffee, petits fours, Boozy marzipan balls, chocolate macaroons. A fruit bar will also be a good fit for the setting. Obviously, the weather is usually much nicer in summer. Summer just gives people a happier and more energised vibe. Think about having a mid-afternoon wedding and then dance throughout the evening with your guests at the reception. 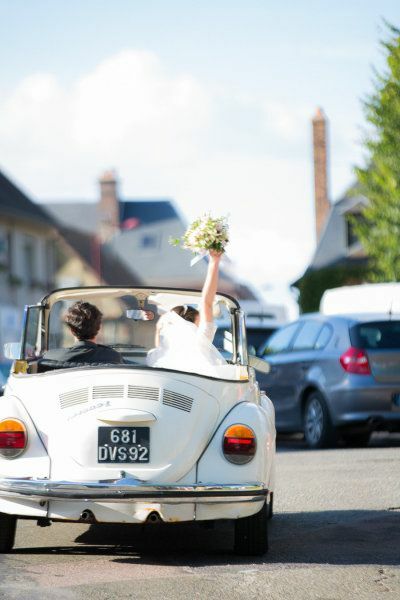 You’ll need to book early for everything if you’re planning for a summer wedding…. the venue, the wardrobe, photographers, catering and florist. Summer weddings are fun and you can start off with plenty of refreshing drinks. Nonalcoholic lemonade or iced tea bars are popular, offering different flavours and colours. Sangria is an easy and refreshing option for alcohol. For cocktails it can be hibiscus iced tea with raspberry liqueur and citron vodka or cucumber-mint lemonade. For entrees, barbecues are an easy to manage option that everyone will enjoy. Make sure you have some grilled vegetarian options. A whole pig roast is a great summer wedding main, but if you prefer a lighter meal, you can always go for chicken and fish. Still, grilled carved meats will never go out of style during summer weddings. Desserts can be a mini-scoop trio of sorbet flavours that mimic the colors or decorations of your wedding. With so many flavors to choose from - melon, lime, raspberry, mango, and more - you're sure to find something yummy that suits your style. Fruit platters served with chilled sparkling wine are also a welcome treat after having some barbecue with friends and family. Or for the ultimate dessert, check out this donut wall! 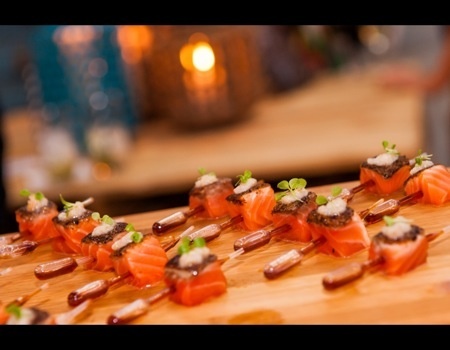 If you need more tips on wedding catering ideas, check out this blog post. Whether you were high school sweethearts, managed to meet in a bar or met through a friend and somehow you found deep and undying love – it’s time to make it stick. Planning a wedding proposal is a major undertaking and might include some sleepless nights. For some, it’s just a spur of the moment decision that feels right. Sure, getting down on one knee while holding a ring box says it all, but proposals should be an unforgettable occasion. It can be at the Eiffel Tower, on a building rooftop, a park, a restaurant or somewhere meaningful. No matter where it is, everything should be right. The New Year is a time for new beginnings and starting with a clean slate and what better way to start it off than by taking your relationship to the next level, right? For many people, New Year’s Eve is a popular day for wedding proposals. The festive mood and the fireworks at the stroke of midnight will surely add a spark to any relationship. New Year’s Eve is a great alternative to Christmas or Valentine’s because you’ll still have the celebration at hand, and your partner will not suspect a thing. If you want to have an intimate proposal, ask the question before you get to the party. The two of you will have your very special moment before heading out and sharing the big news. This is just one example, below are other New Year’s proposal ideas that you can do. You can spell out your marriage proposal in a place your partner would never expect. Letter fridge magnets, a printed canvas in your bedroom when your significant other wakes up or getting up early to slip a fake newspaper page into a real newspaper with your personal message of love. Create a path of flower petals that leads to the engagement ring. It can be from the front door to the bedroom or somewhere nice. Try to spell out “Will You Marry Me?” using those flower petals. If you want to skip the noise and the chaos, you can choose a great restaurant for this intimate and private night. 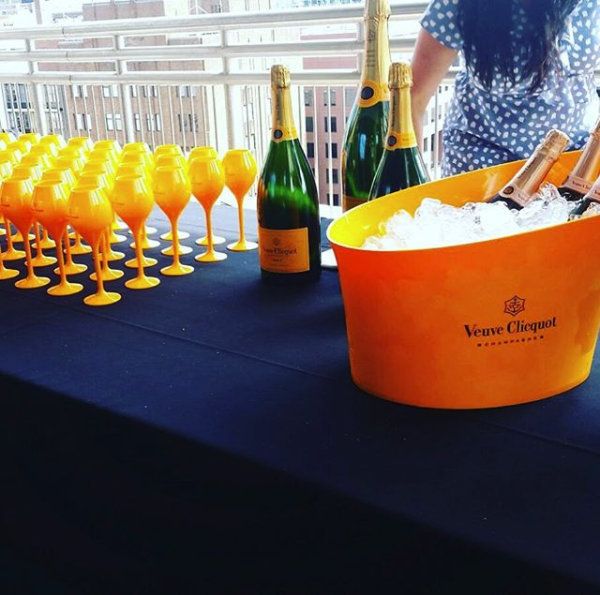 Splurge on the best champagne and the best dinner at the best dining place in town. Be creative, you can put the ring on top of the dessert, hide it in any food that will be served, or you can simply open the ring box and propose! If you don’t like getting out, you can light a fire and watch your favorite movies while snuggling, and when the clock strikes midnight or whenever the moment’s right – pop the question. Write down the phrases in the snow. Be sure that you and your partner can read and see it as you go up the ski lift if you decide to go on a ski adventure. If ever you need to bring out the topic of making a New Year’s resolution, ask what your friends and families resolutions are. And when it’s your turn, tell them the expected answers like losing weight, starting a diet, stop smoking and then say out of the blue “Oh, and get _______ to marry me of course”. That will surely floor people, especially your partner. One of the most romantic ways to get engaged is also one of the most simple. Take the opportunity to propose to your loved one as the bells and the fireworks ring out at midnight in welcoming the New Year. The key to the success of this proposal is the right venue. Pick a special spot, it can be the place of your first date or first kiss or a scenic location. A busy and loud setting with lots of people may not be the best place for a quiet and romantic proposal, but if you enjoy people and the festivities, such a place is perfect for you. Send your unsuspecting partner on a treasure hunt that ends with your proposal. You can start with a clue at home or at work (it can be a text message, email or a handwritten message) that leads to a tour of your favorite spots all over town and at the last, most romantic stop before midnight, you can ask your partner for their hand. You can take out a full page ad in a newspaper (if you have the budget) or a small snippet with that ends with your proposal. Another idea is to call a radio station, make sure your partner also listens when you make the proposal on air over the radio. Rent a Vespa, it can be a vintage or a modern one and then invite your soon-to-be fiancé for a ride around town. Just think of “Roman Holiday” when you do this and remind him or her to be safe by wearing a helmet. Hand over the helmet with the ring box already in it and propose right there. After that, you can zip around town and celebrate the New Year. Buy a box of your partner’s favorite chocolates and replace one chocolate with the engagement ring. When your partner opens up the box and sees the ring, get down on one knee and propose. Happy Holidays! May your proposal be a lovely and memorable one. Serving the right menu is one of the most essential aspects of making your wedding day flow smoothly. If you’re throwing a rustic backyard do, a plated dinner might be too formal. On the other hand, if your reception is in a grand ballroom, buffets or sit-down courses are definitely appropriate. Below are some tips to make sure you’ll have the perfect menu for your wedding day. 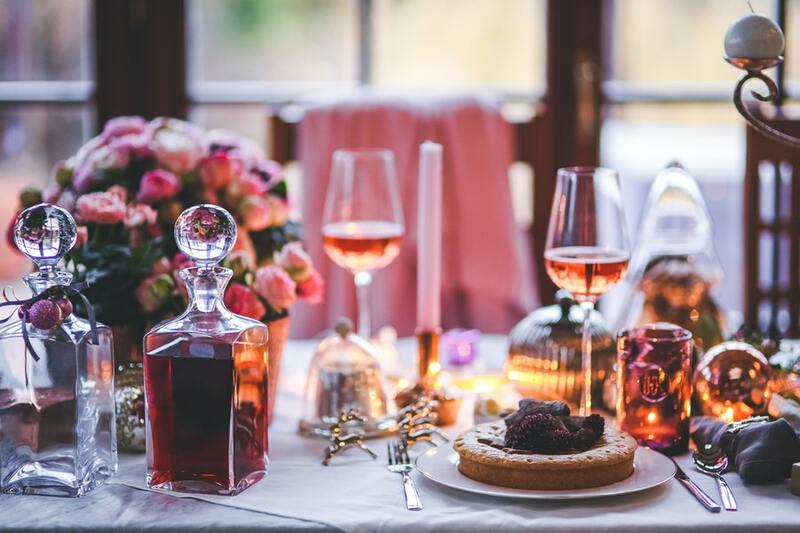 The number of guests, the serving style, the appetisers and the cocktails; every decision will impact cost, thus you need to establish a budget early on and make sure you stick to it. This will help you keep on track of everything. A superb menu always starts with the caterer, but to get your first pick, you’ll have to book early. 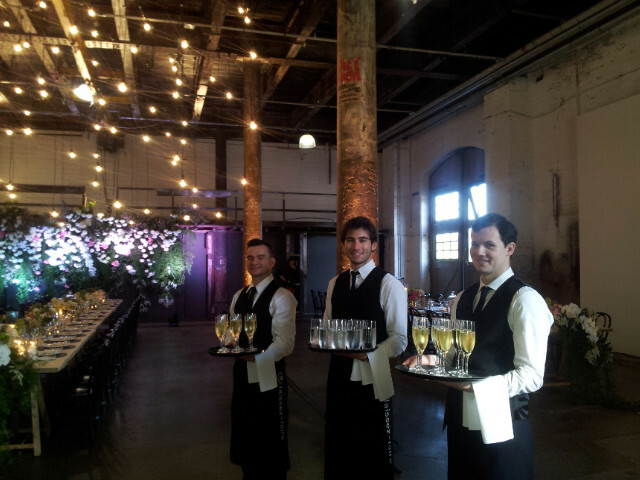 Some industry experts suggest booking catering and venues around 12 months before the event. Keep in mind, some venues will require you to use their in-house caterer or they will have a short list of wedding professionals that they work with exclusively. If you have the opportunity to choose your own caterer, look for a chef that is flexible and excited about trying new dishes and food ideas. Know how many guests will be attending and ensure your maximum budget can handle this amount. This will help you determine your menu. If you want to have an impressive spread, consider limiting your guest list. If you want everybody to be there, just cut costs in creative ways that will still provide an enjoyable and delicious spread for everyone. Vegans, people with peanut allergies or guest who prefer a gluten-free diet should be considered. 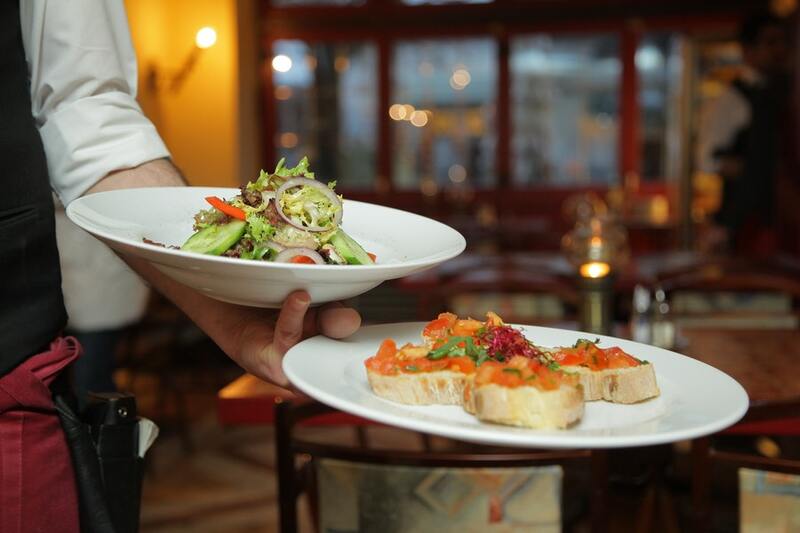 Talk with your chosen caterer about these challenges in advance to prevent any delays when plating entrees and main meals. The couple’s personality should drive the theme of any wedding. Some weddings will have very traditional of formal themes, while others may be more casual. Your themes can be expressed through the attire of the wedding party, the décor, floral arrangements, the ceremony itself, the venue, the season and the type of food served at the reception. Great chefs and cooks plan their menus around whatever is fresh that month or season. Ask your caterer what ingredients will be in season on the day of your wedding and request to have your menu made around those ingredients. Find the freshest options by choosing locally grown produce. Also make sure your caterer is familiar with the foods they are preparing. There is no worse way to make your menu memorable than getting your guests sick from badly prepared food. Cover all bases with your spread by having beef, poultry, seafood and vegetables. Make sure you have something slightly salty, sweet and something savoury to cater to all types of palettes. 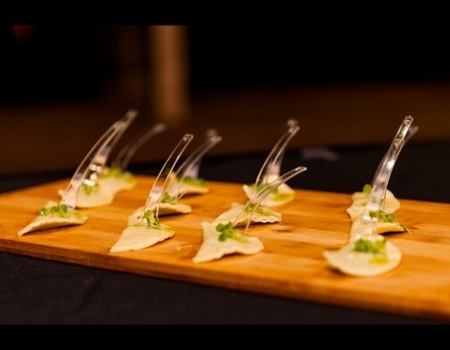 Choose a caterer who cares as much about presentation as they do about good tasting food. First impressions will help make the day memorable. You can also add small touches of your own like a special signature cocktail, a special dessert or napkins in your wedding theme colours. Make sure that you have enough food for everyone. 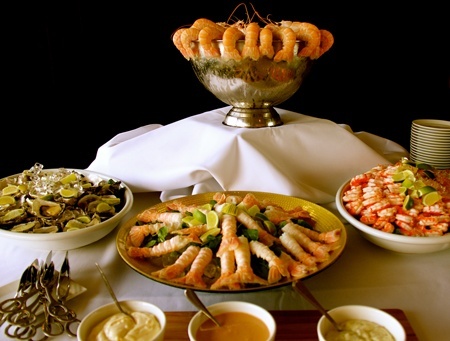 Even if you’re having a buffet, your caterer will still need an approximate head count. 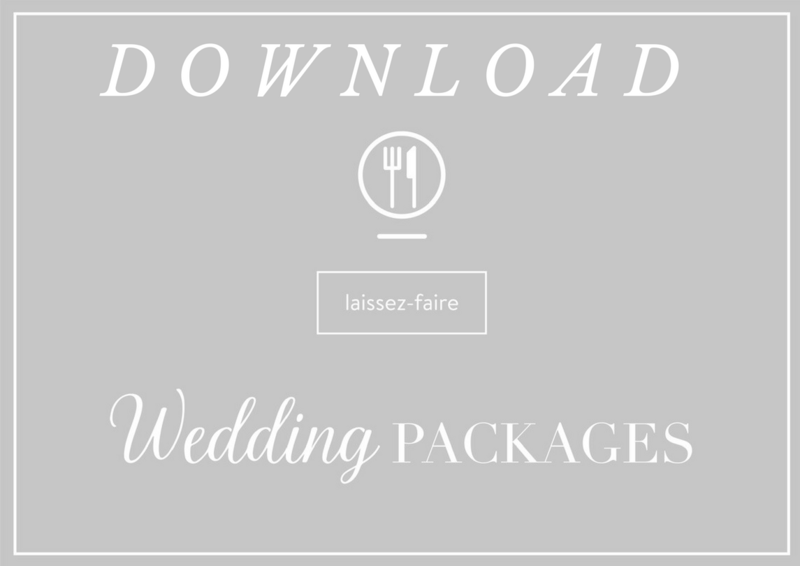 These are some of the things that you need to remember when choosing your wedding menu. Weddings may stay the same, but catering trends are always changing. Shared banquets and platters are becoming more popular at our events compared to serving one or two main dishes to guests at their tables. This casual dinner trend is also perfect for corporate events. Large sharing plates and platters have been the trend lately. 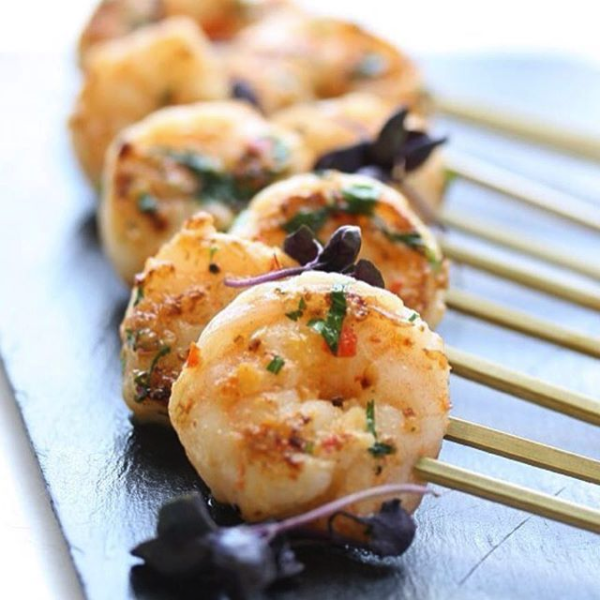 Especially at a wedding reception, the hosts want to make the night a celebration of food as well as a marriage. Sharing big platters provides guests a gastronomic experience - it allows them to taste a range of food choices in small amounts rather than the usual two-dish servings. This way, everyone can cater to their own tastes and try some new things! For weddings, the idea of sharing platters may benefit you in the following ways: It makes your function feel relaxed. Menus can provide a great conversation starter. It gives you time to really enjoy the food with family and friends. Guests can remain seated the entire meal, perfect for a venue that does not hold extra space. Aside from the value of the event itself, the food choices and food presentation matter. The secret lies in choosing and designing a platter with the right food and right flavour that will work well for your event. Add protein items but spice up with adventurous dipping sauces. Include hand-held and easy to eat appetizers. Include options for those who are vegetarians or have a gluten free diet. Go local - include local produce and flavours in the menu. Aside from this, you can ask your caterer for the best possible shared platter menus that can be served for the event you have in mind. Moving on, the next trend in casual dinners is grazing stations. Grazing stations are usually set up in a room where guests are convening before the proper dinner begins. What is usually served is a variety of snacks, nibbles and drinks. One can opt to include light bites from breads, dips, cheeses to deli meats. Grazing stations can balance cuisines that represents the culture of the wedding families or an organisation. This is a hit at any event since it mirrors the wonderful diversity of Sydney. 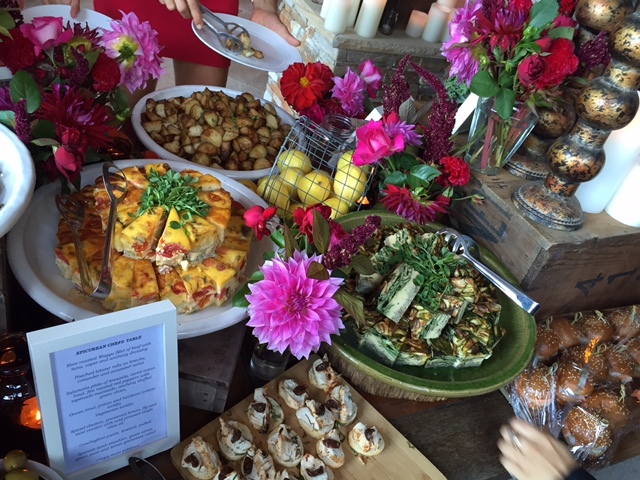 Prior to the main event, grazing stations can provide an engaging way for guests to start the party. It can also help entertain guests in case some delays are happening. Plus grazing stations are flexible. You can include a few of your choices as well as incorporate recommendations from your caterer. You can easily go casual or gourmet with grazing stations. And many others. Grazing stations let you get really creative. Now, the point of events is not only to provide the best food there is. The social side of gatherings is now put into focus. So make sure that you provide the best food and provide the best experience for your guests too. We recently produced an exceptionally ambitious wedding event for a cosmopolitan couple with discerning tastes and levels of service. 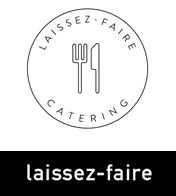 Laissez-faire was asked to play a key role for the evening to celebrate their union and help their guests enjoy good food. After six months of in-depth planning we were able to execute an event of dramatic proportions with the style of food having received overwhelming acclaim. To ensure a successful and enjoyable special day, service was discreet yet attentive. Collaboration and constant communication within the entire team allowed Laissez-faire to shine at this event. 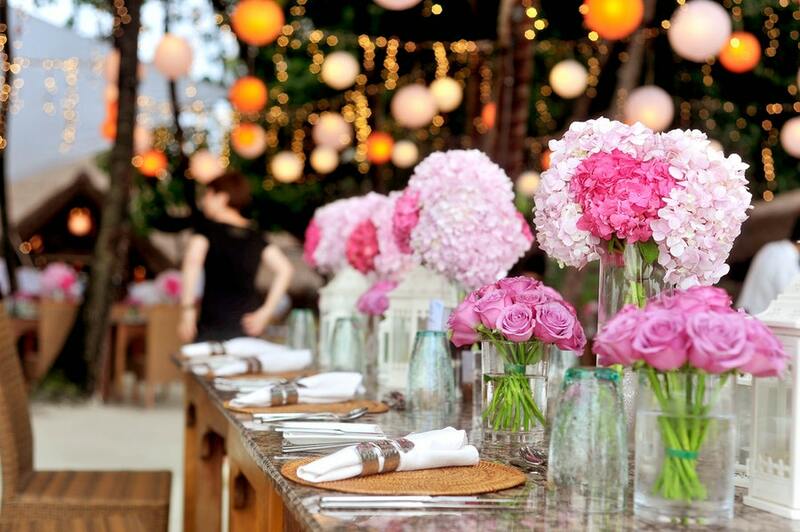 From the drinks - Cocktail Club mixologist, AV – Norwest productions, lighting – Love Lights, flowers - The Floral Craftsman, videography - Soda Films, planning - Bree Gomberg, Director of White Rabbit Projects to the fabulous nanny service – Nannies and Helpers. 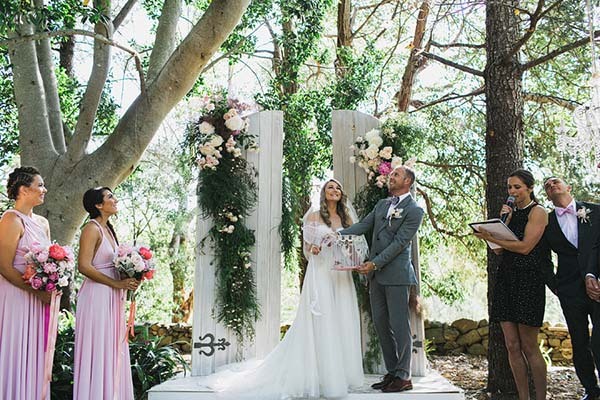 All of these parts came together to make a whole at Clarissa and Rania's wedding day which took place at a private mansion overlooking a romantic bay setting. “Food presentation and taste was high on the list of priorities for this client and event and your team exceeded all our expectations. Food was plentiful, tasty and exceptionally presented. Your staff were also fantastic. This is what made the night especially seamless. Their ability to think quickly and to appease guests on a range of requests throughout the evening was very much appreciated and even guests commented on how many there were of you!!! Every time we turned around your staff were only too happy to assist in any way they could possible. 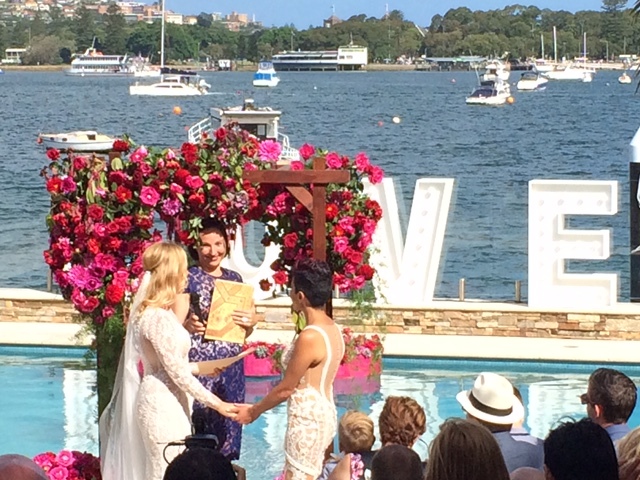 Best wishes to Clarissa and Rania from the team at Laissez-faire! Provide a unique garden wedding guests wouldn’t soon forget. Denneya and Chris. An interior designer and architect. This couple exudes style and know exactly what they want. Guests had travelled from interstate and New Zealand to be part of this spectacular Thursday wedding. 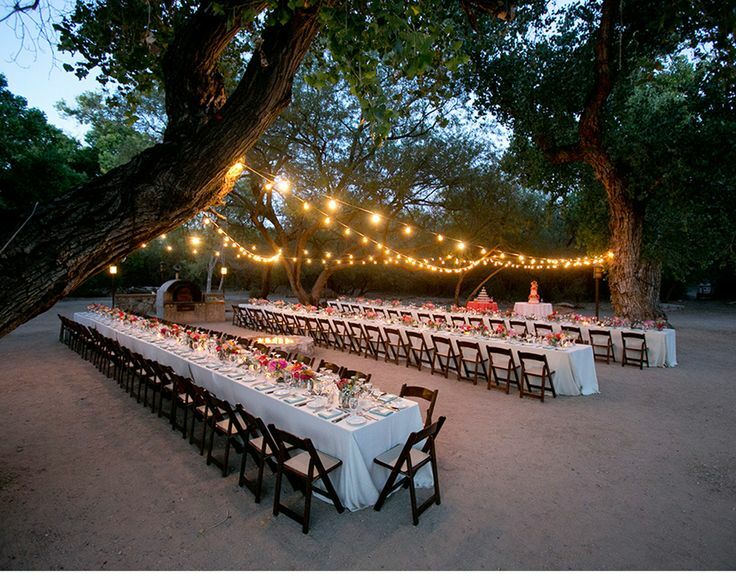 The ceremony was held in the garden adjoining the pool house, under a canopy of ancient trees. Note: click on any of the image to view full size versions. 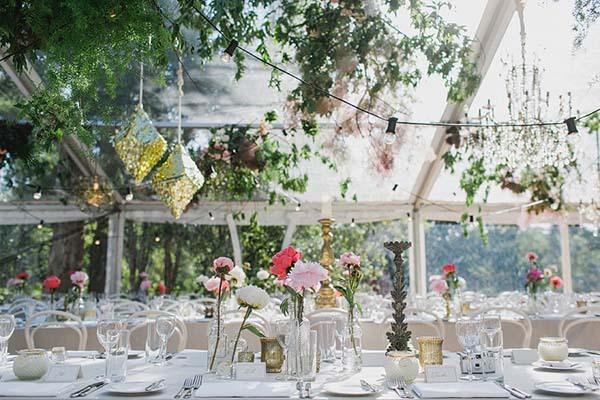 The reception was held in a clear marquee dripping in greenery and gold centrepieces. The tables were adorned in antique gold candle sticks and holders along with delicate vases with pops of colour. Even the bar – an old horse shed, was themed with florals cascading from the roof. A mix of vintage and bohemian. 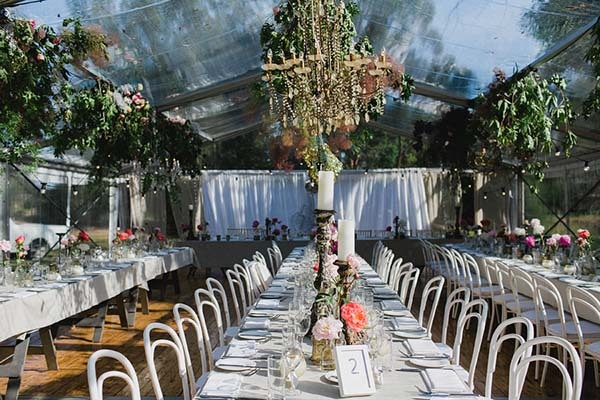 The clear marquee and surrounding gardens were styled to the nines. Touches of white, gold and pink were dotted throughout the space. A chandelier hanging over the purpose built dance floor made for a romantic setting as the sun went down. When guests arrived to the ceremony, they were welcomed with homemade pink lemonade served in beautiful ornate urns. After the ceremony, the couple chose delectable canapés for guests to enjoy in the garden. 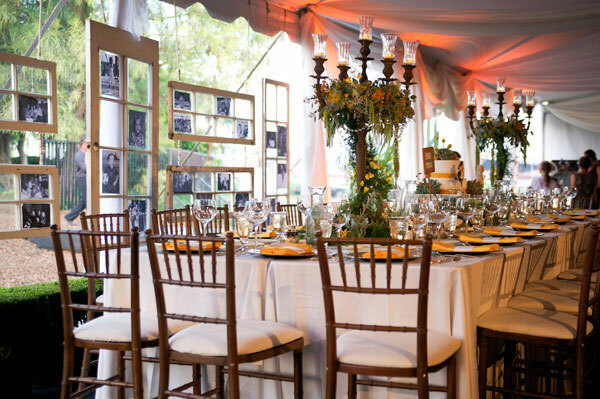 Once they moved into the dining marquee, guests were served with an alternate entrée and main. The couple knew their guests would be up and about after the meal, so dessert share platters were sent to the tables and to the dance floor. A wedding is a special occasion that needs thorough planning. 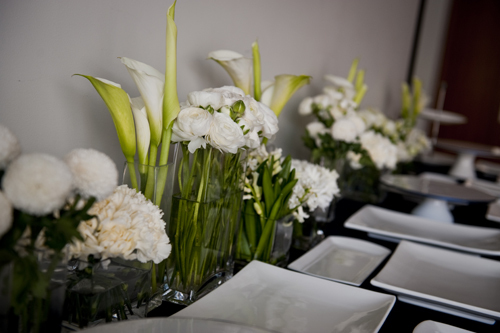 Absolutely everything needs to be well thought out from flowers, to venues, to food and reception. Yes, the reception! A spectacular wedding and reception will still be remembered by all of your guests ten, twenty or even fifty years later. So how do you make your wedding reception special? Well, we have some great tips for you. 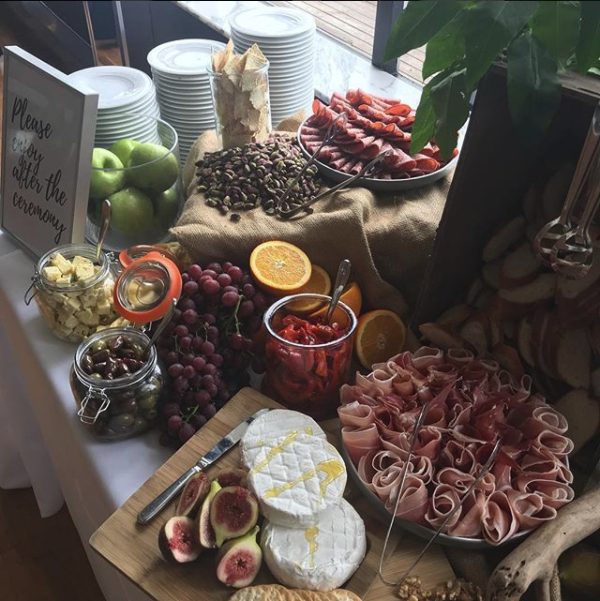 If you have the space in your venue, you may want to vary your food stations to give your guests lots of different options. That is, if you are open to the unconventional themes we have featured below. (These food stations are also great for other events, not just weddings). This anti-pasto food station is a fun addition to your unconventional wedding event. 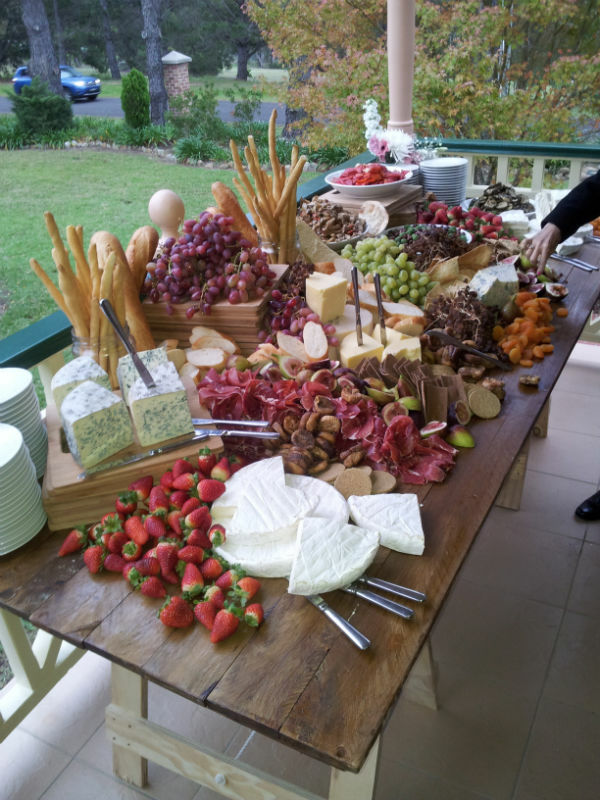 A cheese station on the other hand is a sumptuous way to draw your guests to the buffet tables! This burger station pictured below looks wonderful and your guests will love helping themselves to these awesome, bite-size treats. 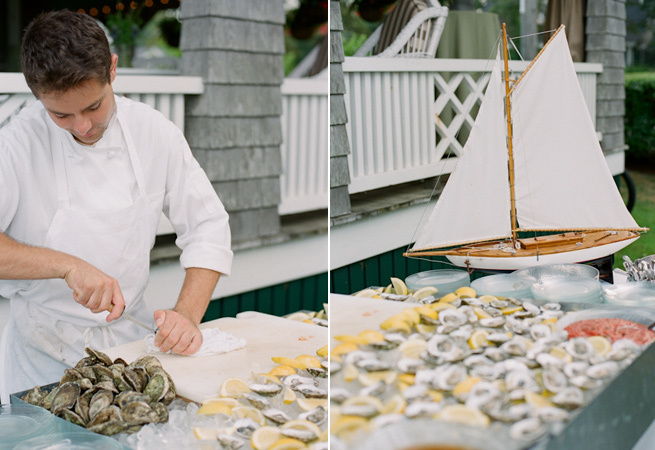 If you're looking for an exotic taste, this oyster food station looks appealing. It sure is one way to treat your guests to a new experience. This seafood station looks delicious! Make sure to keep this one stocked since it's sure to be a hit among your guests. These tiny food samples will surely make your guests appreciate everything on your menu and will prove the adage, "size doesn't matter". 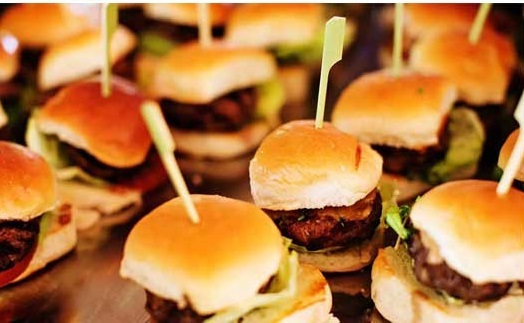 As one of the hottest trends in catering today, miniaturized food portions are being requested left and right! Check out these sample miniature foods. This little taster also features salsa verde. Its presentation alone is one way to make your reception special. This seared and blackened Atlantic salmon cube looks like perfection on a platter and on your reception menu. 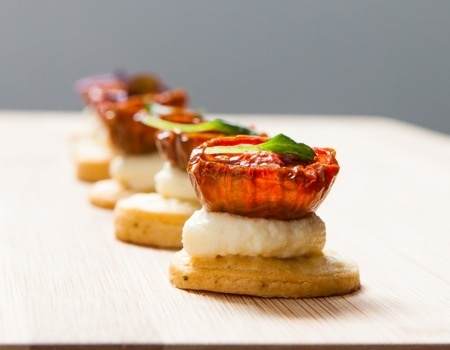 This shortbread miniature food option is topped with buffalo mozarella and dried tomato. Your guests will definitely be complimenting the chef for this one! 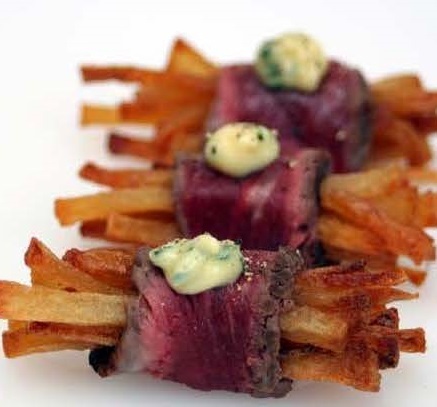 Steak and Chips with Bearnaise Sauce- this canapé is super cute! 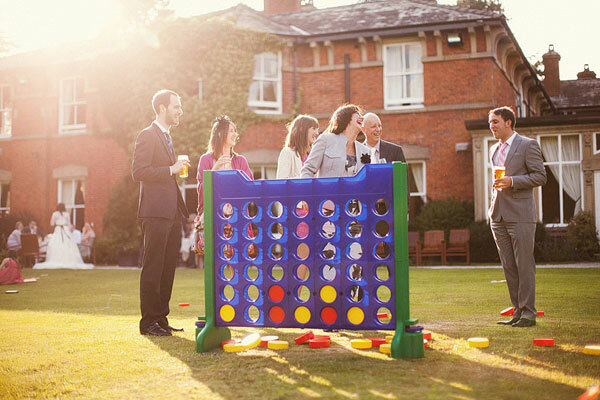 Fun activities and games are ways to break the ice amongst your guests and also a fun way to make your wedding memorable. We have a few sample activities you can try below. 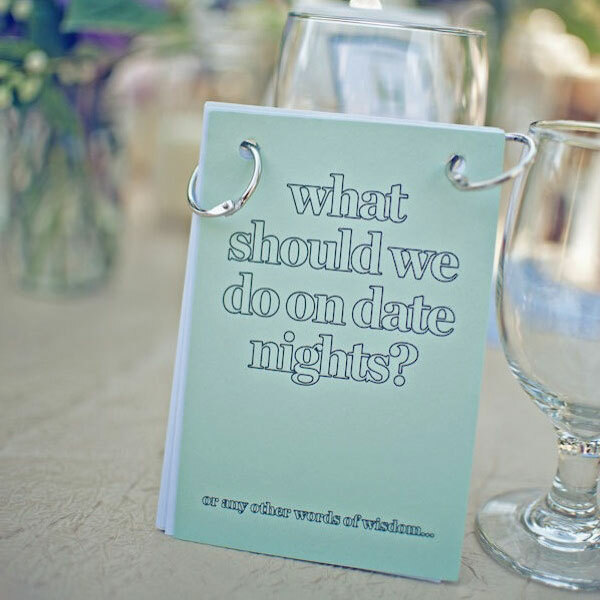 Add some pens with this booklet at every table and ask questions your guests can answer. You can ask for wedding advice, possible names for future children and other suggestions for the new life you will be leading. You'll have fun reading these after the event. You can set these up indoors or outdoors. Prepare oversized boardgames and have your guests have a go at it. 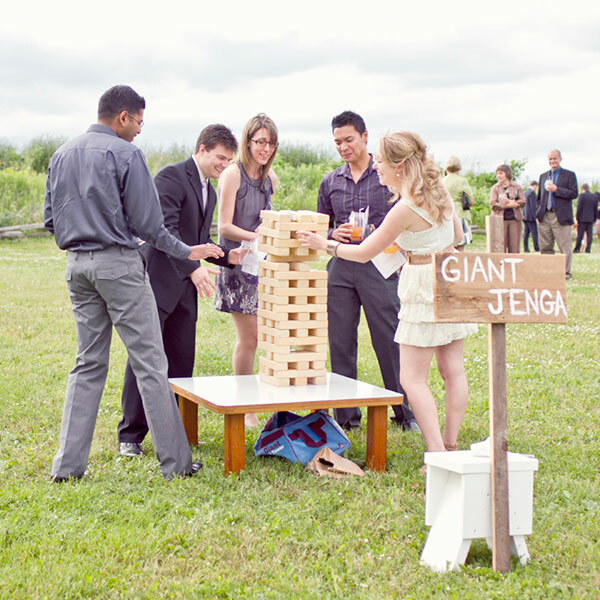 Take a look at giant Connect Four and Jenga! Using your guests and family photos can make them feel special. You can use old ones and use them to spark conversation and relive some old happy memories. 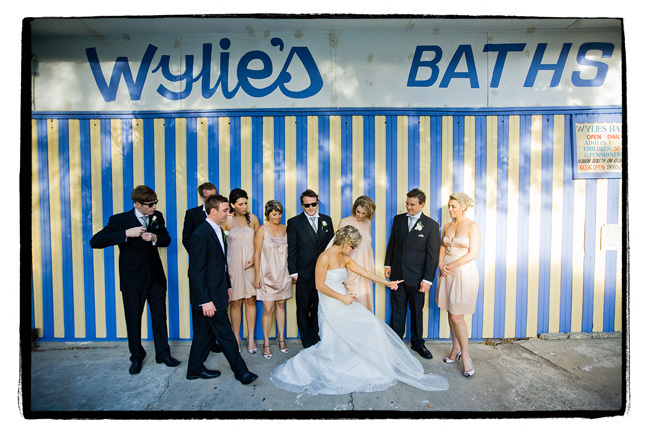 By doing this, you have integrated your friends into your own special day with a trip down the memory lane. So instead of getting the generic souvenirs most weddings give out today, have a think about your guests tastes instead. 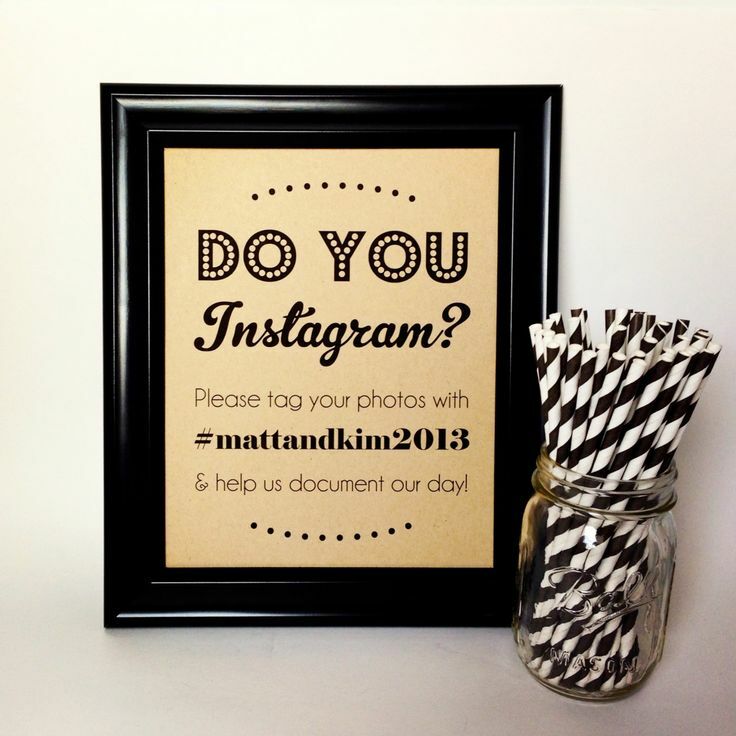 For example, you may like to create an Instagram hashtag for your reception and ask your guests to tag photos of you. This makes a lasting memory of the day. 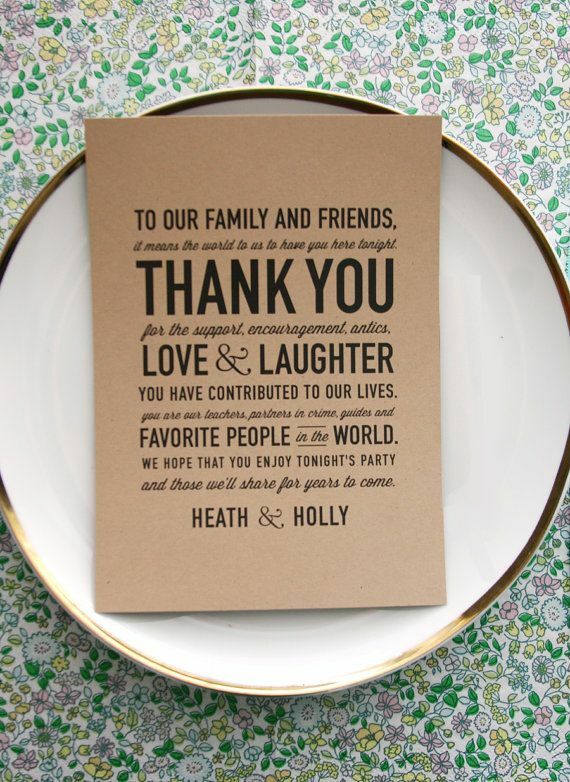 Or instead of place cards, you can hand out your personal notes to your guests. This adds a personal touch to your wedding and makes your guest think that you are thinking about everything on this special day, down to the minute details. 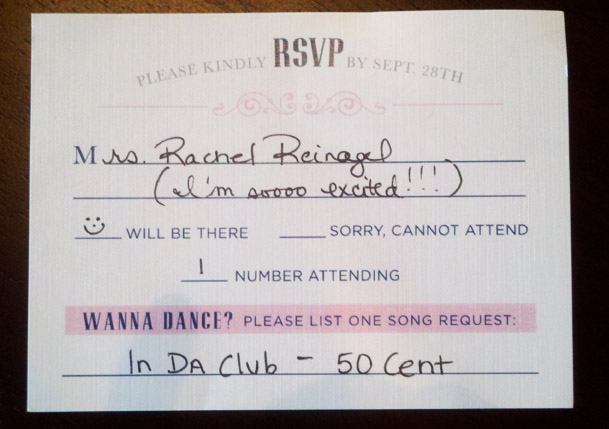 This is a really fun way to get your guests to hit the dance floor. Make sure you take note of their requested songs, update your DJ and let them play at your reception party. Again, this will make your guests feel that they are really a part of this big day instead of just guests. ...and this second one is a perfect ensemble. If you don't think this is amazing then maybe we can't advise you! But this is a perfect combination to one memorable wedding. This baked ricotta may be small in serving but it packs a great taste that will make your guests happily surprised on your big day. The ingredients are lemon, thyme as well as zucchini. Serve your guest a variety of these meringue desserts and it will surely make their day. The pictured tarts below are one of a kind lemon tarts and salted caramel chocolate tarts. Isn't this awesome? 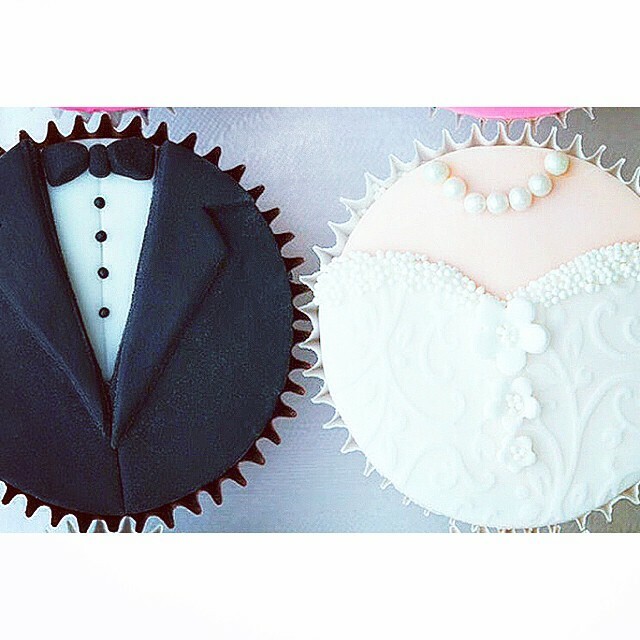 This cupcake could be a good alternative to a wedding cake, all you need to do is make use of your creativity. 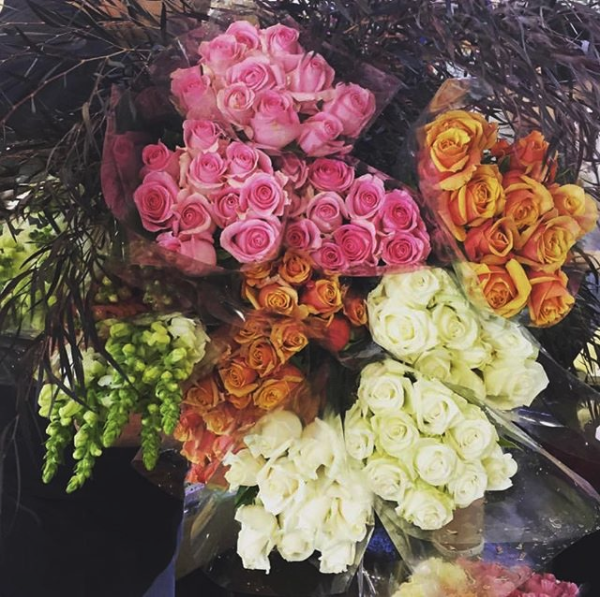 Your flower arrangements don't need to be expensive, they should be special to you. You can add or request the flower that is significant to you as groom and bride. Maybe you could choose the same flowers as were in the bouquet you gave your bride on a date or anniversary. Just make everything relevant and tell your guests the lovely story. 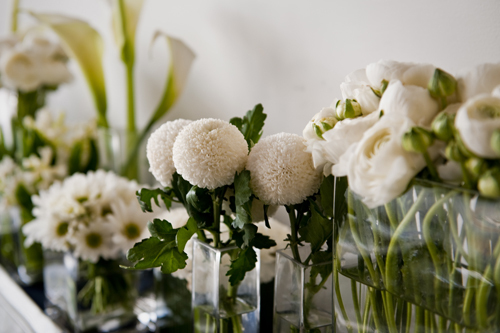 Here are some simple yet elegant flower ideas for your reception. 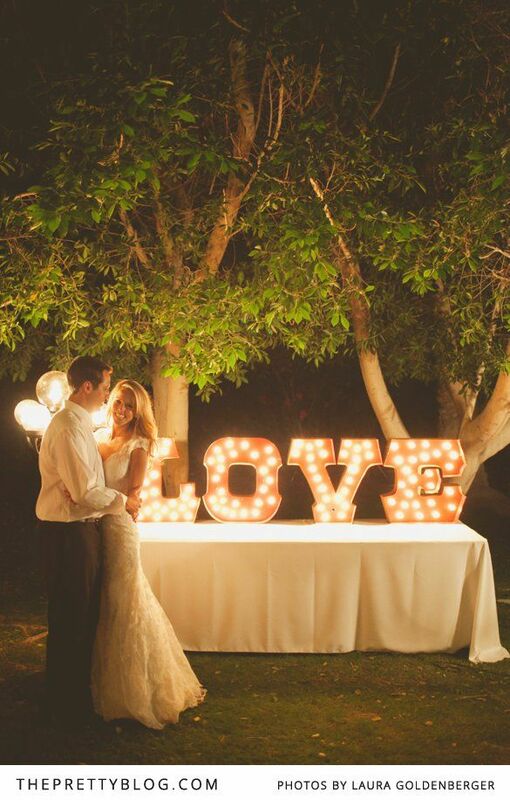 You can use lights to play up the drama at your wedding reception. Here are some photos of how you can use the power of lighting to your advantage. 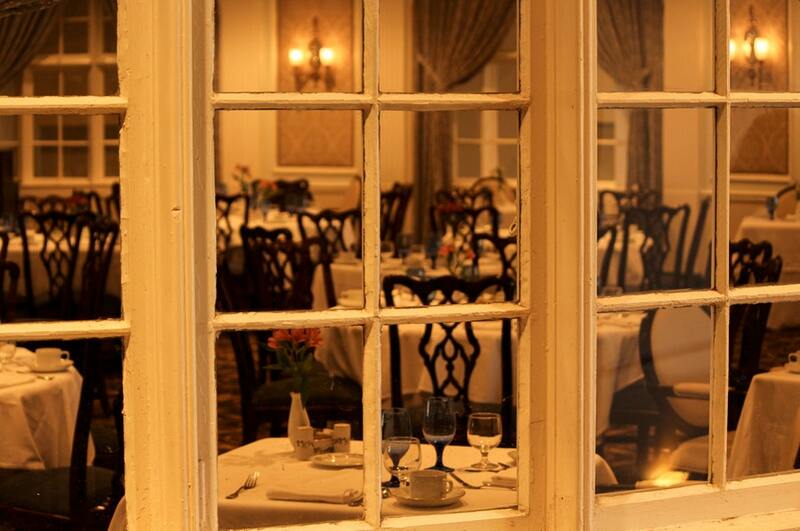 Don't forget to check out our Wedding Dinner options by clicking the banner below. Create a memorable, unique wedding ceremony and reception for a gorgeous couple in only 3 weeks! As soon as we met, we knew near enough wouldn't nearly be close enough. This couple knew what they wanted and how they wanted it. We were up for the challenge and didn't disappoint. Our inaugural visit to the Elston Room, Carriage Works. And wow - did it leave its mark on us. This venue exudes old world charm of yesteryear with historic memorabilia dotted around inside and outside the venue. The distinctive 19th century industrial atmosphere of the former railway carriage and blacksmith work shops have been retained though out the regeneration of the building. 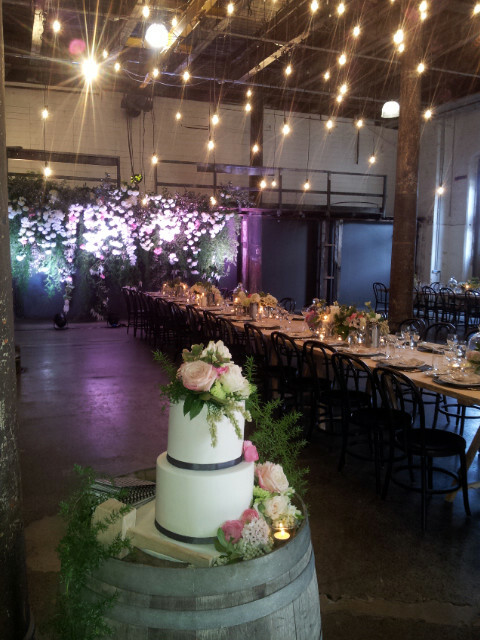 Jason James along with Seed Flora created a floral wonderland with touches of dim candle light throughout the venue. Cascading light bulbs fell from the 13 metre high ceiling creating a modern ambient lighting in an historic space. 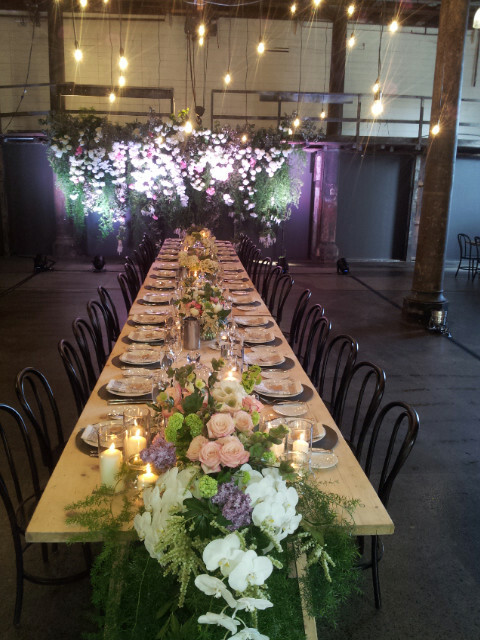 Draped florals flowed from the tables, spilling over the polished concrete floors. In line with the ceremony that took place prior to the reception, Persian sweets wee served to the guests as they lined up to congratulate the newlyweds. For pre dinner canapés, the couple selected peking duck and a mini pizzette - a nod to modern local influences. Tables overflowed with grazing platters - starting with antipasto, followed by the shared entree. This was share platters of a delicate crab and angel hair pasta aside a rich beef cheek ragu. Guests shared mains of beef with chef's unmissable red wine jus and atlantic salmon with guerre blanc. The main dishes were accompanied by colourful salads - zucchini, mint and lemon; traditional greek salad and roasted rosemary root vegetables. 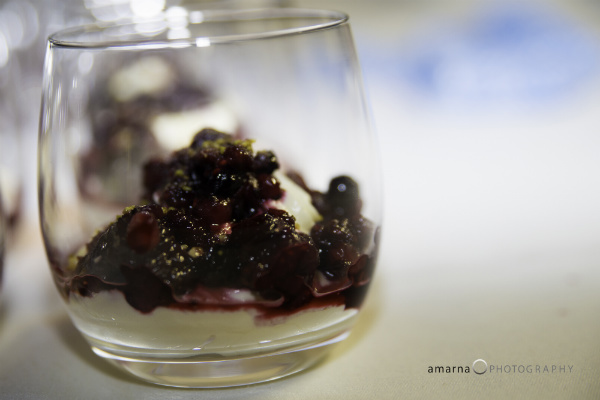 To follow in the tradition of sharing meals with family and friends, the desserts were mini but many. Miniature lemon meringue tart, raspberry ganache tartlet and a vanilla and buttermilk panna cotta with dragon fruit coulis. The couple literally smashed the wedding cake - an exploding shell of chocolate bursting with all kinds of candy and jellies for guests to enjoy. Check out our Wedding Dinner menu by clicking on the banner below. 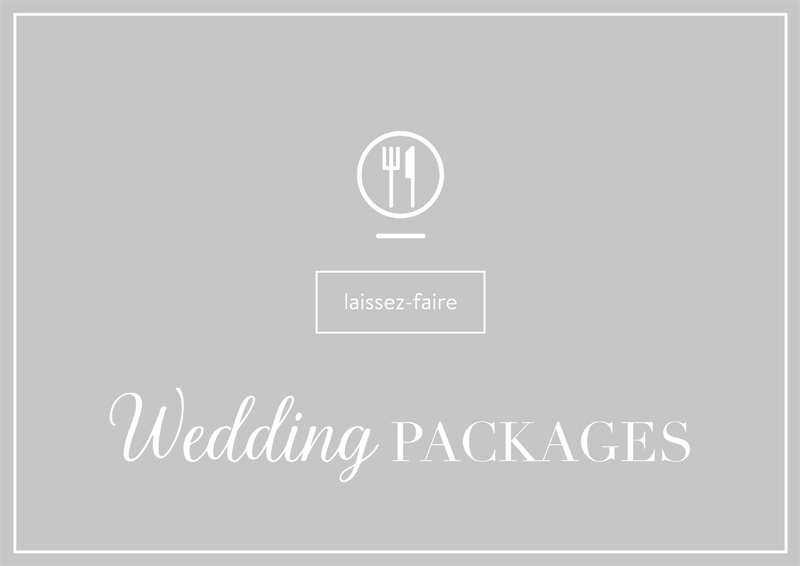 Laissez-faire is excited to be attending the One Fine Day wedding fair on September 5 & 6. One Fine Day is a wonderful event, featuring a hand-picked collection of wedding vendors and suppliers. 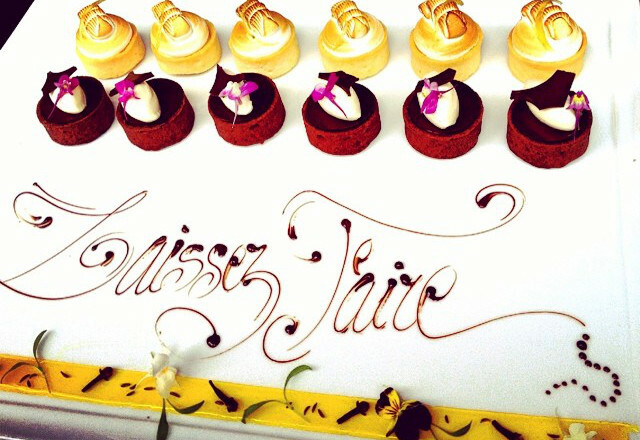 At Laissez we have more than 25 years of experience offering premium event catering, with beautifully crafted settings, mouth-watering menus and amazing venues. We're proud of the weddings we've been involved in - take a look at some of the romantic moments captured in our wedding showcase. We understand you want the very best on your special day. 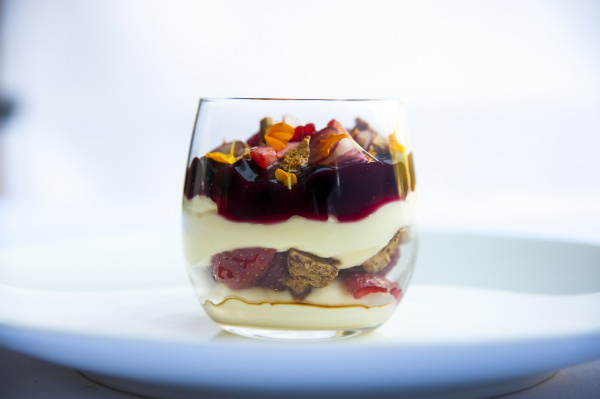 We are committed to sourcing the best ingredients available, working with local suppliers, artisan cheese producers and quality local fruit & vegetable growers to create inspiring, seasonal driven menus that bring the best produce to your table. Come and meet us at One Fine Day - we'd love to create wedding magic with you. It's on September 5 & 6 - you can purchase One Fine Day tickets here. Just got engaged? Congratulations! But don't know where to start? Relax! We've got everything you need to plan the perfect day. It's almost wedding planning season again: a time for flowers, beautiful dresses, and elaborate cakes. But there's also the potential for massive stress. If you're a bride-to-be, here are 12 top tips from industry experts to help make the process a bit easier. Late planning will drastically reduce the options. This could result in a second best venue, and far from a dream wedding. We recommend you start thinking at least 12 months ahead. 2. Make the planning fun. With so much to think of, planning a wedding can be really stressful. It's easy to forget to enjoy the journey. We encourage our couples to make a celebration out of as many planning events as possible. For instance, if you're having a dress fitting, meet with your entourage for lovely afternoon tea afterwards. To do this, create a master document with supplier names, contact numbers, and other important details. Not only will you feel in complete control during the planning stages, you can hand it over to one of your trusted bridesmaids on the day! 4. When looking for that special unique venue, ask yourself two questions. What kind of wedding do you want? And how many guests do you want to invite? Only once you know the answers to these questions should you start researching possible venues. It may feel a bit like being back in school, but taking notes when visiting venues or other suppliers is a quick reference if you have questions later. You're bound to forget a lot of the details by the time you get home. 6. Make a menu you would enjoy. Many future brides and grooms worry about the wedding menu and guest’s preferences or dietary requirements. We always advise couples to choose a menu they would like to eat and pick out their own favourite dishes. We’ll look after the rest! We have heard some real horror stories about the cake collapsing just before or during a wedding! To avoid this, have your cake supplier oversee the set-up of the wedding cake. Then try not to move the cake after it's been arranged. 8. Be smart with your budget. If budgets are tight, I would always advise clients to spend a bit less on elements such as wedding cars or gifts, but to get the reception looking right. That's where you and your guests will be spending most of your time. 9. Think about the lighting. This is crucial to creating the right mood. Uplights and candles are relatively low-cost ways of introducing colour into your theme. 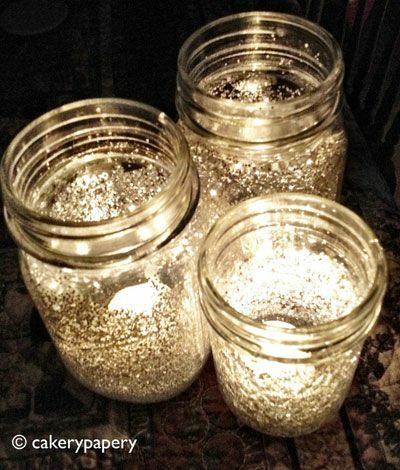 Don't forget to think of outside lighting too – outdoor lanterns are really cheap and look amazing. 10. Relax before the big day. It's easy to get swept up in stress surrounding a wedding. The solution? Treat yourself to a little luxury. If you're in a hotel with a spa, we recommend going for a leisurely swim or massage the night before. It will leave you feeling refreshed and will help you get a good night's sleep. 11. Consider themed thongs as a favour. This is our favourite! Ladies can kick off their shoes and dance the night away without the agony of high heels. Plus they last for years after the wedding, meaning they'll bring back fond memories. 12. Make it about you and your partner. This is a special day, meant to celebrate a future together with the person you love. Experts stress the need to keep the day personal. As an added bonus, guests love attending weddings that are individual and will be pleasantly surprised by any unusual or quirky adaptions.